The Rowan D-II ice hockey team was inconsistent to say the least heading into this past weekend. It’s safe to say they got back on track, with 21 goals in two games. 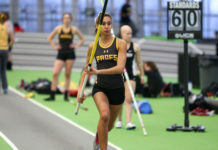 The Profs blew away a struggling Montclair State on Saturday night at home by a final score of 9-1. As was the case for most of Rowan’s home games this season, goaltender Justin Natiello was unstoppable after allowing an early goal. Forwards Bobby Penrod, Nick Ramos and Connor MacEwen all had two goals apiece in the win. Penrod increased his mark as the team’s scoring leader with nine. This would all change in the second game of a back-to-back weekend, though. When asked if he expected to be the scoring leader through seven games as a freshman, Penrod didn’t see things this way. “I thought the seniors would lead the way and show us how it’s done,” Penrod said. “I’ve come in, I’m playing my game and it’s working”. Forward John Simmons contributed with two assists. All eight of his points up until Saturday’s game had come by way of sharing the puck with his teammates. With Rowan sitting on a healthy lead in the third period, Montclair’s captain Sam Enright got into a scrum with Rowan’s Frank Christy, skating up behind him and punching him in the back of the head. This led both men to the ground and into the penalty box. When it came to the nine goal outburst, Caulfield didn’t have much to say. “We’ve been struggling a bit so we are going to take what we can get,” he said. 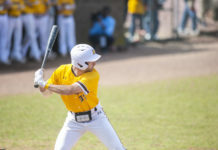 The team had a quick turnaround as they got on the bus to Havertown, Pennsylvania to take on Saint Joseph’s University on Sunday. The scoring bug hitched a ride with them. The Profs offense exploded for twelve goals, while the defense did their job in keeping St. Joe’s off the scoreboard. The 12-0 result was the Profs first road win of the season. Ramos led the way with a hat trick, while Simmons scored his first goal on the season as well as tallying two assists to bring him into a three-man tie for points with 12. 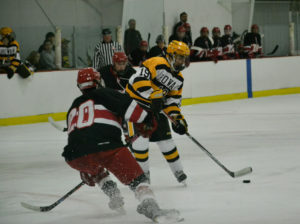 Aaron Segnello and Anthony Dellerose each had two goals apiece. Rowan entered this past weekend with many fans scratching their heads at the team’s inconsistency. They silenced those critics by outscoring opponents 21-1 in back-to-back games. The team will stay on the road as they travel to West Chester University on Friday night at 9:15 p.m., before returning home to Hollydell Ice Arena on Saturday, for an 8:15 p.m. game against Penn State University.